The missus was kind enough to lend her visual stylings to this embellished “lifestyle” snapshot of my latest pet project. In addition to showcasing the smart print job by James Tucker of The Aesthetic Union, the image also gives some clues about the inspiration for this lovingly hand-lettered declaration of devotion. For the more historically inclined: the wordmark was drawn as an interpretation of mid-nineteenth century American ornamental penmanship seen through the eyes, or hands rather, of a 1930’s advertising letterer. The latter incarnation was typically less decorative, softer, and comparatively looser. Round terminals, looping strokes and a playful shift in the letters’ relative proportions lent warmth and friendly flair. A split stroke treatment was given to part of the lettering in order to update its appearance, in addition to providing emphasis. What better way to add an individual touch to a personal pronouncement. 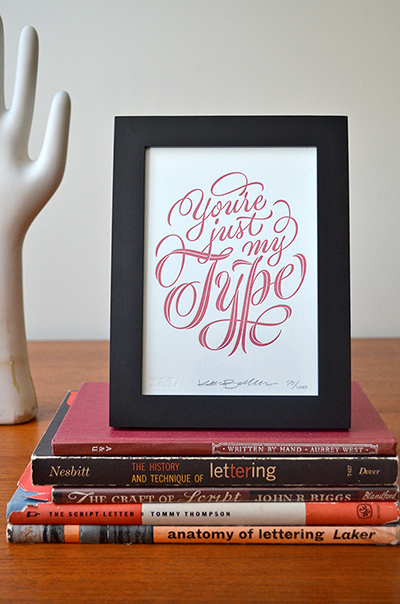 Surprise a sweetheart, or treat yourself, with one of these limited edition prints.